100 years have passed since Endre Rozsda’s birth, and his work seems to emerge now in Hungary as one of the major Hungarian oeuvres connected to surrealism. Almost fifteen years were needed though to achieve this goal: after a 1998 retrospective of his painted work in Műcsarnok, Budapest (followed also by a representative exhibition of his graphic works in 2001 – Szépművészeti Múzeum, Budapest), the most important efforts in promoting Rozsda’s work were carried out by the private gallery Várfok Galéria and its owner, Károly Szalóky. Several exhibitions dedicated to Rozsda’s works have been organized in Budapest during these fifteen years, and some of the major catalogues and articles on his works have been written by the art historians connected to the Gallery. A decisive role in this process was played also by Júlia Cserba, who was very active during the past decades in promoting the works of Paris-based Hungarians, and who was one of the curators of the Műcsarnok retrospective. Art historians like Sándor Hornyik or Gábor Pataki, the most important authors dedicated to the interpretation of Hungarian surrealist painting and to the group of the European School in general, also contributed with their expertise to a better understanding of Rozsda’s work. If we examine what the new catalogue presenting Rozsda can add to our knowledge about the artist, we can conclude that there was still room for the subjective and personal level that could contribute to a clearer picture. But time has come also for a contextual and systematic approach which is carried out in the present volume by authors like Sándor Hornyik and Borbála Kálmán, and also for more theoretical interpretations like the approach of József Készman that deals with the representations and the implications of temporality in Rozsda’s paintings. Many of the texts included into the catalogue mention André Breton’s short landmark interpretation of Rozsda’s work from March 1957 – interpretation that connected Rozsda’s art to the 1956 anti-totalitarian revolution from Budapest, but also to surrealist sensitivity, being included into the revised edition of Surrealism and Painting. Breton noted: “Here is the supreme example of what had to be kept hidden if one wanted to survive, and, equally, of the inner necessity that had to be snatched from the vilest coercion. Here, the forces of death and love are pitted against each other; everywhere under the magma of blackened leaves and broken wings irresistible forces are seeking a way of escape so that nature and the human spirit may renew themselves through the most sumptuous of sacrifices, that which the spring demands in order that it may be born.” The most important factor here is the gesture of incorporation, of course – the affirmation of Rozsda’s affinity towards surrealist vision, later on doubled with his participation at a surrealist exhibition in Milan (Mostra internazionale del Surrealismo, Galleria Schwarz, 1961). Quoting Breton, authors of the catalogue like Arturo Schwarz, Sándor Hornyik and Borbála Kálmán insist upon the links that connect Rozsda to the surrealists – which means that the reception of his work is strongly connected now to the reception of surrealism within the Hungarian cultural field. 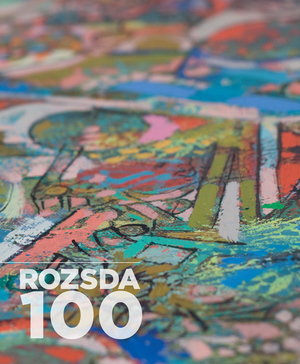 The catalogue, consisting of 158 pages, does not attempt to include a representative selection of Rozsda’s art this time (after the previous ones edited in Hungary beginning with 1998), but is centered around the material of the exhibition entitled Rozsda100 – The Parca’s Thread (Várfok Galéria, 12. 09. 2013 – 11. 23. 2013), which featured 37 works out of which 30 had never been presented to the public before. However, the texts included into the catalogue, all of them published in 3 languages (Hungarian, French, English) are quite representative as far as the painted work is concerned. In his introduction, Károly Szalóky, owner of Várfok Galéria recalls his first meeting with Rozsda at the Bateau-Lavoir, when they agreed to cooperate for some future exhibitions organized in Budapest. This meeting, as we know now, was decisive for the visibility of Rozsda’s art in Hungary, although it needed many more events to be organized during the past 15 years. In I remember Endre Rozsda and A Painters’ Painter Arturo Schwarz and Françoise Gilot, respectively recollect personal memories about the painter dating back to the sixties or even to the thirties. While Schwarz centers his presentation around the term of the ‘marvellous’ used in a bretonian sense, Françoise Gilot outlines even some shifts in the painter’s work seen from the proximity of a close friendship. Sándor Hornyik’s paper entitled Sacred and Profane Love: Endre Rozsda and the Surrealism of the 1940s offers an insight into the historical and theoretical context of Rozsda’s works, with references to texts by André Breton, Árpád Mezei, Imre Pán, Marcel Jean, Ernő Kállai, but also to more general theoretical approaches by Hal Foster, Rosalind Krauss, Erwin Panofsky, Georges Bataille. He offers a fascinating interpretation of Rozsda’s painting Sacred and Profane Love (reproduced also in Breton’s Surrealism and Painting) as a paraphrase after Titian’s Amor sacro e Amor profane, taking into account also the technique of rotation that Rozsda used during the painting process of several of his works. The question of “mad love” is, according to Hornyik, a primary element that connected Rozsda to Breton’s surrealism. In developing his own vision and techniques, his stay in Paris might have helped him connect to the concept of surrealist love, but, as Hornyik points out, the atmosphere created by theoreticians like Árpád Mezei, Imre Pán and Ernő Kállai in Budapest during the 1940s was itself quite inspiring for painters of the European School – a group that Rozsda co-founded with them. József Készman discusses the question of time in Rozsda’s painting in his article entitled Time’s Dream – In the Parcae’s Thread: Time-Based Painting? This way, he can include into his analysis the experiencing of “parallel” times in case of Rozsda and his early interpreters from Hungary, but also two examples of precognition in the case of the painter, events that were always able to carry special significance in the case of surrealist artists like Victor Brauner or Breton himself. One of the key statements of Készman is the following: “Within Rozsda’s oeuvre, time constitutes an unavoidable concept – it is, in effect, one of the ‘raw materials’ of his art. As a true surrealist, he imagined that he yoked time, he rode astride it (…) Time functioned as a kind of new dimension in his works, thereby substituting perspective.” Placing Rozsda’s experiments in the context of theoretical texts by Heidegger, Husserl, Descartes a.s.o., the author manages to create a necessary theoretical distance between Rozsda’s self-interpretative texts and his paintings. In the last interpretative text of the catalogue, Borbála Kálmán, in a sort of monographical approach, realizes a detailed, historical description of Rozsda’s oeuvre in its connection to surrealism. The Milan exhibition, the concepts of time and dreams, the specific surrealist painting techniques are discussed here, while details like the one suggested by Françoise Gilot in an interview offer us a differentiation quite necessary for a clearer picture about Rozsda: “He always said that he wished to reach a dreamlike state, in other words exactly what the surrealists did, who no longer wished to think by means of thoughts, but rather draw from the subconscious. (…) It was precisely drawing through which he was able towards the more surrealist perception (…), much earlier than in painting.” There is indeed a difference between the painted work and the graphic work of Rozsda (not to mention his photography) – for which Sarane Alexandrian offered a memorable explanation in a text included into an earlier catalogue of Rozsda’s graphic work: “Ce créateur triple a voulu qu’aucun de ces modes de creation ne se répètent les uns les autres – et il y a réussi. (…) J’ai relevé nombre d’autoportraits – car il avait un narcissisme très affirmé – et dans l’un d’eux il a trios têtes (de face, de trois quarts et de profil) raccordées au même cou, comme pour revendiquer les trois activités évoquées ci-dessus.” Borbála Kálmán opens up new sources and resources for the prospective interpretations of Rozsda’s works, be they historical or theoretical. Her attempt, doubled with those of the other authors of the volume, convince us that the most relevant context of interpreting Rozsda’s oeuvre is that of surrealism – understood not as a technique, but, in agreement with André Breton, as a vision about the world.